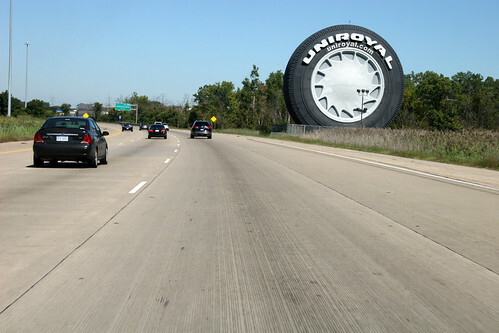 World's Largest Tyre can be seen just a few miles from Detroit Metro Airport on the US Interstate I-94 highway and is one of Detroit's most recognizable roadside attractions. 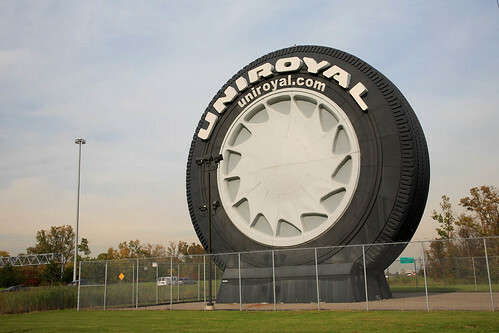 With a height of 80 feet (~24.4 metres) the giant tyre is the largest tyre model ever built. 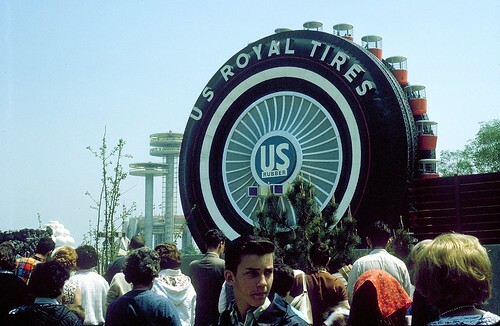 The tyre was originally made as a giant Ferris wheel (shown below) for the pavilion of U.S. Rubber (the predecessor to Uniroyal) at the 1964/65 New York World's Fair and was one of the popular attractions of the Fair. Reportedly Shah of Iran as well as Jacqueline Kennedy along with John Jr. and Caroline also took a ride in it. After the close of the fair in 1965 it was dismantled, cut in 188 sections and transported to Detroit, where it was reassembled and anchored off I-94 at the tyre company's Allen Park, Michigan, sales office. The tyre was remodelled in 1994 and a new hubcap was added to give it a more modern and sleeker look. 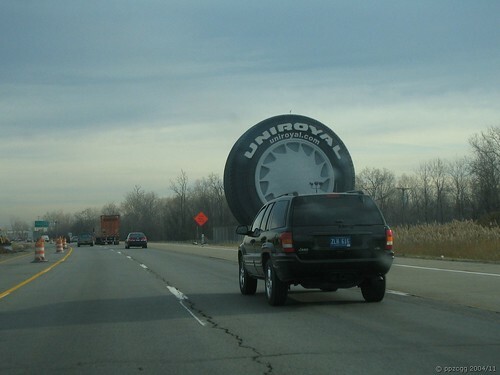 In 1998 a huge 11 feet (~3.4 metres) long nail (reportedly World's largest) was pierced in its tread to advertise Uniroyal's "NailGard" - self-sealing tyres. The nail however was removed after some time and donated to the city of Allen Park. It was auctioned on e-bay for USD 3,000 to local philanthropist Ralph R. Roberts. It has been named "The Big Nail" and has been used as an icon to draw attention to deserving charities, events, and organizations. If your talking about fake tyres its not the biggest..
Thats in Yamba, Just outside of Renmark in South Australia near the Victorian and South Australian border. Thank you for the info. From the picture the Yamba tyre sure looks big. A cursory search hasn't yielded much info on it. I will make a deeper search now and after getting the details will add it the blog.